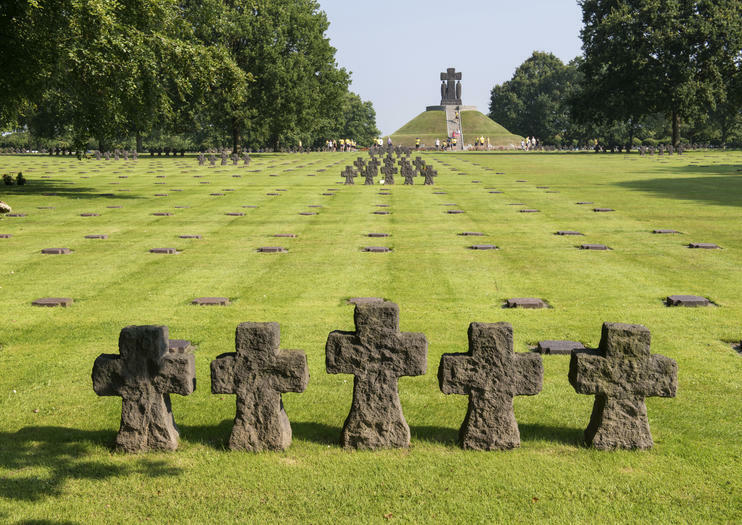 As the largest German WWII cemetery in France, the La Cambe German War Cemetery serves as a poignant reminder of the lives lost on both sides of the war. It’s a moving site, with its grey schist crosses and dark, flat headstones offering a more somber atmosphere than that of the American and Commonwealth cemeteries nearby. Although initially serving as a temporary American cemetery, today 21,222 soldiers from the German Armed Forces are buried at La Cambe. At the center of the cemetery, a 6-meter-high grassy hillock is capped with a single cross and serves as a mass grave for 296 soldiers, many of which are unknown. Just outside of the cemetery, the La Cambe Peace Garden opened in 1996, and is home to 1,200 maple trees, each planted by an individual or organization to symbolize reconciliation and lasting peace. A visitor center is also located at the entrance to the cemetery and offers further insight into the soldiers buried on-site. La Cambe German War Cemetery is located in La Cambe, around 30km west of Bayeux, off the N13 motorway.